On a warm, sunny last day of August, the Washington Lady Blue Lion tennis team hosted the squad from Greeneview High School (Jamestown). Washington won the non-league match, 5-0. At first singles, Megan Downing defeated Ellie Adkins, 6-0, 6-2. At second singles, Jen Richards blanked Molly Nixon, 6-0, 6-0. Third singles saw Sydnie Hall beat Sara Shoemaker, 6-0, 6-2. At first doubles, Bethany Wilt and Brooklyn Foose downed Katy Hilbig and Erin Miller, 6-2, 6-2. At second doubles, Brynne Frederick and Payton Maddux defeated Brooklyn Biggs and Mannda Shoemaker, 6-2, 6-1. In j-v play, Washington’s Bre Taylor lost to Greeneview, 8-6 and in doubles, Chyna Cupp and Mei Kobayashi lost to Greeneview, 8-4. Washington will play at London Tuesday and will host Miami Trace Thursday at 4:30 p.m. in a match that was previously rained out. 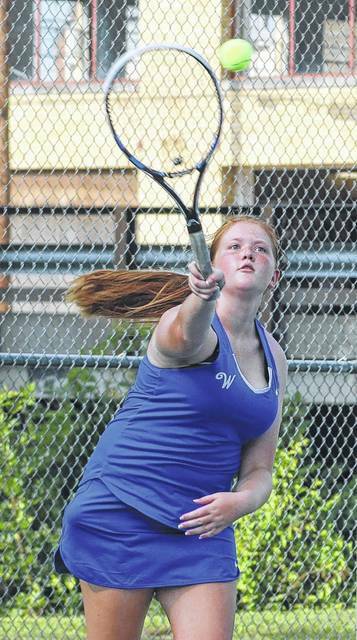 Washington’s Sydnie Hall serves during a third singles match against Greeneview High School Thursday, Aug. 31, 2017 at Gardner Park.